Seagate has unveiled the world’s largest SSD drive that has a capacity of 60TB. This dwarfs the previous record held by the Samsung PM1633a, which had a capacity of 15.36TB. 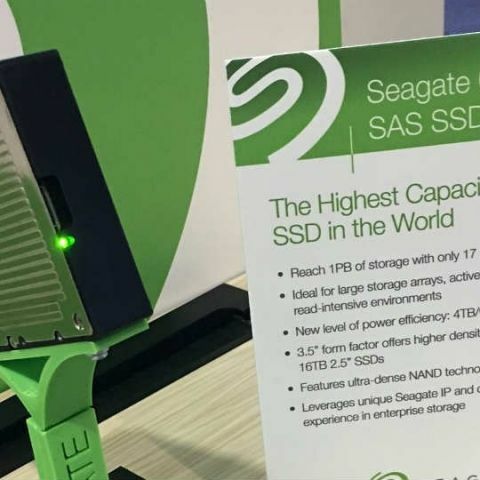 Seagate’s 60TB SAS SSD was unveiled at the Flash Memory Summit and is expected to be available next year. The storage space offered by the drive is enough for 400 million photographs or 12,000 DVD movies. The SSD is aimed at enterprises and offers the same 3.5-inch form factor, which makes it easier to replace the drives currently being used by data centers. The company also noted that only 17 such drives are needed to get 1 petabyte (PB) of storage. Seagate also notes that due to the drive’s flexible architecture, there is also a way to scale the storage upto 100TB, while keeping the same form factor. Besides the 60TB SAS SSD, Seagate also unveiled the 8TB Nytro XP7200 NVMe SSD. This SSD is aimed at hyperscale data centers. It features a single PCIe interface for high-speed data transfers and four separate controllers, which provide processing power up to four times faster than comparable drives. The company also notes that the technology used by this easily integrates into all-flash system arrays.